While the 2017 Acadia goes on sale spring 2016, GMC announced the production of the 2017 Acadia Limited. The GMC Acadia Limited will be an additional trim option that is based off of the SLT trims. According to GMC, the limited package was created to make sure that the Acadia could meet almost any need of a SUV shopper. Unlike the other Acadia options, the Acadia Limited delivers additional cargo space and seating for up to eight passengers. The standard 20 inch chrome-clad wheels provide a sleek and impressive appearance. The limited package includes plenty of safety and security technology, like navigation radio like IntelliLink. Head-Up Display projects your speed and other important driving information so you do not have to take your eyes off of the road. With the help of radar sensors, Side Blind Zone Alert warns drivers of vehicles in their blind spots. To help drivers easily reverse out of a parking spot, Rear Cross Traffic Alert scans the areas adjacent to your car to help avoid any accidents. Entertain the kids with the available Rear Seat Entertainment System that includes a DVD player with a remote and overhead display. The 2017 Acadia Limited will also offer a sunroof and all-wheel drive (AWD). 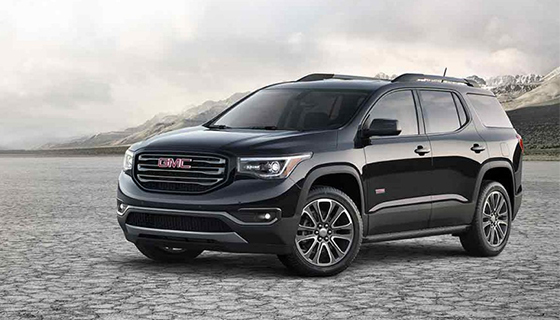 The GMC Acadia Limited will be in production at Lansing Delta Township from June 2016 through March 2017. More information about the 2017 GMC Acadia Limited will be released at a later date. Stay tuned! Would you like to learn more about the Acadia? The sales consultants at McGrath Buick GMC Cadillac can answer all of your questions!